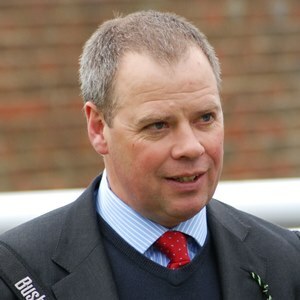 Nowadays, Clive Cox is best known as the trainer of Harry Angel, winner of the Darley July Cup at Newmarket and the 32Red Sprint Cup at Haydock, not to mention the Cartier Sprinter Award, in 2017. He is firmly established at Beechwood Farm Stables in Lambourn, near Hungerford, Berkshire, which he has rented from John Francome since May, 2000, but winners haven’t always come easy to the Somersetian. His first winner as a trainer, Good For The Roses, in a maiden hurdle at Newton Abbot in March 1991 was also his last as a jockey. Cox enjoyed a successful as a National Hunt jockey, riding 100 winners, although he later admitted, “There isn’t any part of my upper body that hasn’t been rearranged.” He rode once in the Grand National, parting company with the favourite, Sacred Path, at the first fence in 1988. His initial attempt at training was no more successful and after a year in Wootton Bassett, Wiltshire he gave up and became assistant trainer to Mikey Heaton-Ellis at nearby Barbury Castle in 1992. When Heaton-Ellis died, at the age of just 41, in1999, Cox took over the licence. Once again, he wasn’t exactly on overnight success and it wasn’t until 2002 that he broke double-figures for a season. However, his breakthrough year came in 2003, when he recorded his first major success with New Seeker in Tote International Stakes at Ascot. New Seeker won the same race again two years later, when it was staged at Newbury while Ascot was redeveloped, as well as the Dubai Duty Free Cup at the same course later that season. In 2007, Cox saddled his first Pattern race winner, Beacon Lodge, in the Horris Hill Stakes at Newbury and hasn’t looked back since. He has gained a reputation for his eye at the sales and has produced relatively cheaply-bought horses to win major races time after time. His first Group 1 winner, Gilt Edge Girl in the Prix de l’Abbaye de Longchamp in 2010, was bought for just 17,000 guineas. Reckless Abandon, who won the Darley Prix Morny at Deauville and the Vision.ae Middle Park Stakes at Newmarket in 2012, cost just 24,000 guineas, while Lethal Force, who won the Diamond Jubilee Stakes at Royal Ascot and the Darley July Cup at Newmarket in 2013, cost just 8,500 guineas. In 2016, Cox had his most successful season ever thanks, in large part, to the Group 1 victories of Profitable in the King’s Stand Stakes and My Dream Boat in the Prince of Wales’s Stakes with the space of 24 hours at Royal Ascot. He finished the year with 65 winners and over £1.5 million in total prize money for the first time.